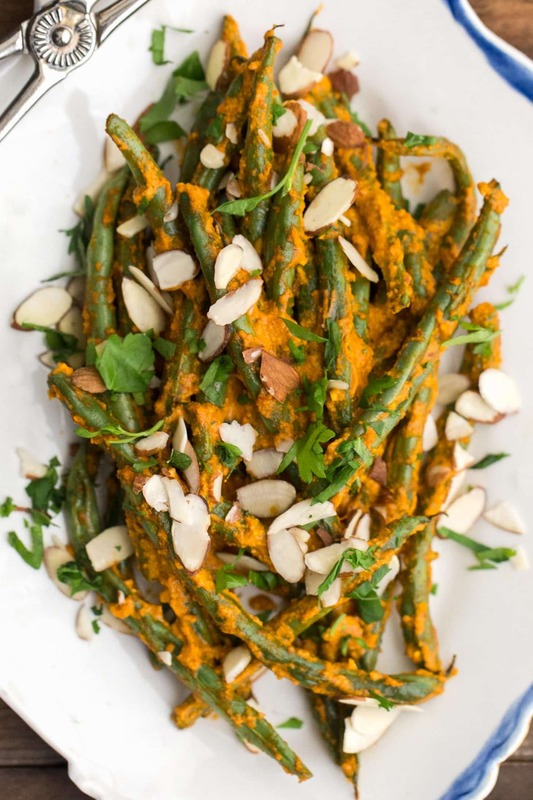 Roasted Green Beans with Romesco | Naturally. One of my favorite pizza places has an entree of garlicky green beans and I decided to take it a step further and toss roasted green beans with romesco sauce (which may look familiar from this pizza I just posted). The green beans make for a perfect pizza side dish and it’s a bit different from the traditional salad that I usually serve with pizza. Roasted green beans make for a lovely summer side dish, especially when tossed with a flavorful romesco sauce. Bring a pot of water to a boil and add green beans, blanching for 3 to 4 minutes. Green beans will be bright green and just tender. Drain and place in a roasting pan. 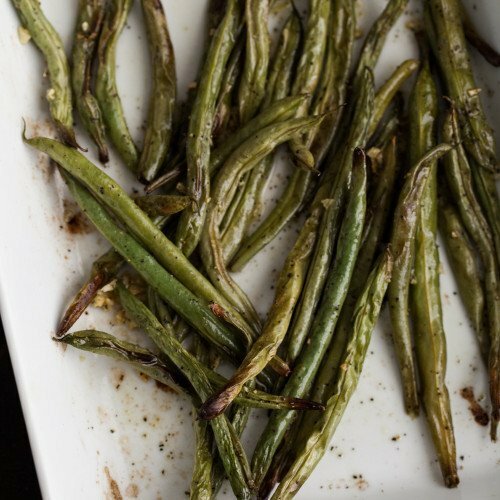 Toss with olive oil and roast until green beans start to blister, 20-25 minutes. Once the beans are done, remove from oven and toss with romesco sauce. Top with almonds and minced parsley before serving. Tips & Tricks: Make a full batch of the romesco sauce and use in other recipes like this pizza or this grilled cheese. Grains: Serve atop cooked grains like sorghum, farro, or spelt. I like a heartier grain to pair with the green beans, similar to this roasted green bean recipe. Make it a Meal: I’m forever trying to turn side dishes into mains. A couple easy options for this: add grains from above with an hard boiled egg or chickpeas.. Cooking: Less an ingredient variation and more of a different way to cook- I’ll blanch the green beans but instead of roasting, I’ll stick them on a grill pan and place over the hot grill. Perfect for those nights you do not want to heat up the house with the oven! Love this idea! We have a bunch of green beans from the market sitting around in the fridge, so will have to try this out. 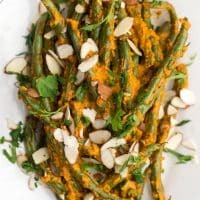 I love romesco sauce but have never thought of putting it on green beans. Yum! Absolutely delicious! 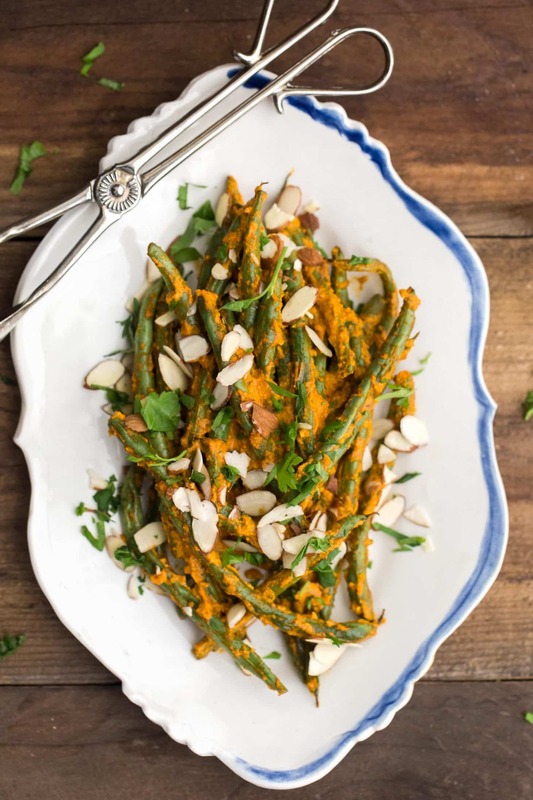 Romesco sauce and Green beans make an excellent combination. I have been looking for a detailed recipe and found you.